Drainage water recycling is the practice of capturing excess water drained from fields, storing the drained water in a pond, a reservoir, or a drainage ditch, and using the stored water to irrigate crops when there is a water deficit. Relative to conventional drainage, drainage water recycling has two major benefits: (1) increased crop yield resulting from supplemental irrigation and (2) improved downstream water quality. This practice holds great promise within the U.S. Midwest where tile-drainage is prevalent and the crop season can often be punctuated by both excessively wet and excessively dry periods. 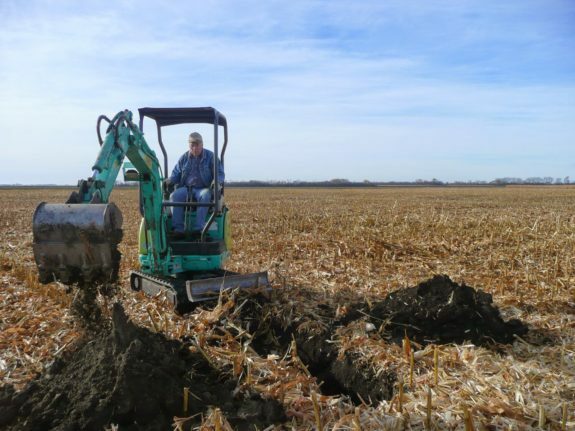 The Transforming Drainage project brings together research from experimental drainage water recycling sites across the U.S. Midwest to evaluate the full potential of drainage water recycling to improve crop production and water quality within tile-drained landscapes. Questions and Answers about Drainage Water Recycling for the Midwest. 8 page overview by J. Frankenberger, E. Kladivko, G. Sands, D. Jaynes, N. Fausey, M. Helmers, R. Cooke, J. Strock, K. Nelson, and L. Brown. Purdue University Cooperative Extension Service. Reducing Nitrogen Loss with Managed Drainage and Polymer-Coated Urea. 1 page abstract by Nash, P., K. Nelson, and P. Motavalli. 2017. Greenley Memorial Research Center Field Day Report. Reducing Phosphorus Loss in Tile Water with Managed Drainage in a Claypan Soil. 1 page abstract by Nash, P., K. Nelson, P. Motavalli, M. Nathan, and C. Dudenhoeffer. 2017. Greenley Memorial Research Center Field Day Report. Corn Yield Variability of Drainage and Subirrigation Systems in a Claypan Soil. 4 page report with visuals by Nelson, K. 2017. Greenley Memorial Research Center Field Day Report. Soybean Yield Variability of Drainage and Subirrigation Systems in a Claypan Soil. 5 page overview with colored figures by Nelson, K. 2017. Greenley Memorial Research Center Field Day Report. MU Drainage and Subirrigation (MUDS) Research Update for Claypan Soils: 2002-2016. 13 page paper with detailed tables and colored figures by Nelson, K. and D. Harder. 2017. Greenley Memorial Research Center Field Day Report. Effects of Drainage Tile Depth and Spacing on Crop Response to Free Drainage and Drainage Water Recycling. 5 page overview with images by Nelson, K. and D. Harder. 2017. Greenley Memorial Research Center Field Day Report. Corn Response to Drainage Water Recycling in a Blackoar Silt Loam. 2 page summary by Nelson, K., D. Harder, and M. Mungyeko-Mayola. 2017. Greenley Memorial Research Center Field Day Report. Irrigation Reservoir Evaluation for a Proposed Irrigation Reservoir on the Grace Greenley Farm, Knox County, Missouri. 5 page overview by Chockley, T. 2017. Greenley Memorial Research Center Field Day Report. Irrigation Reservoir Design Summary for a Proposed Irrigation Reservoir on the Grace Greenley Farm, Knox County, Missouri. 5 page overview by Comstock, M. 2017. Greenley Memorial Research Center Field Day Report. Subirrigation Plan for MU Greenley Research Center. 16 page paper with illustrations by Ecosystem Services Exchange. 2017. Greenley Memorial Research Center Field Day Report. Geologic Considerations for a Proposed Irrigation Reservoir on the Grace Greenley Farm, Knox County, Missouri. 4 page overview by Rosenfelder, A.J. 2017. Greenley Memorial Research Center Field Day Report. Wetter springs, hotter summers: Climate change threatens Iowa farm economy. Des Moines Register. Des Moines Register (2018) — Describes issue and predictions with multiple images and testimonies from the community. Drainage control systems boost corn, soybean yields. Herald-Whig (Jan. 22, 2017) — The article describes the structures and systems used to boost crop yield. 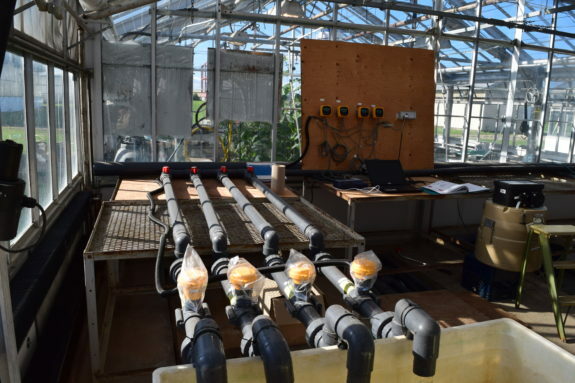 MU drainage system increases yields, reduces nutrient runoff. Bolivar Herald-Free Press (Jan. 14, 2017) — Kelly Nelson from the University of Missouri Extension outlines the research findings. Combo of drainage, subirrigation can cut costs, increase yields. Drainage Contractor (Jan. 3, 2017) — Kelly Nelson from the University of Missouri Extension outlines the research findings. A New Beginning: More than 400 guests attend Greenley field day. College of Agriculture, Food & Natural Resources at University of Missouri (2017) — The 240-acre Grace Greenley Farm was deeded over to the Greenley Research Center. Battling Soil Saturation: Poorly drained soils cause headaches for landowners. College of Agriculture, Food & Natural Resources at University of Missouri (2017) — Peter Motavalli and Kelly Nelson with the University of Minnesota College of Agriculture talk about their efforts against soil saturation. 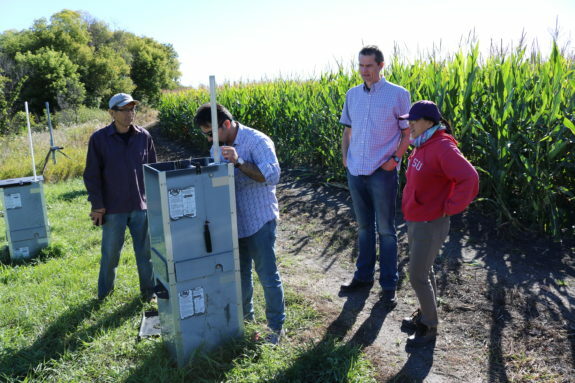 Keeping Nutrients in the Field: Greenley Research Center Helps Farmers Manage Water on Their Fields. Road to Discovery: MU Agricultural Research Centers Magazine (2017) — For nearly 20 years, the University of Missouri College of Agriculture, Food and Natural Resources’ Greenley Research Center, near Novelty, has worked to help local farmers manage the water on their fields. MU drainage system increases yields, reduces nutrient runoff. High Plains/Midwest Ag Journal. High Plains/Midwest Ag Journal (2017) — Agronomist Kelly Nelson at the Greenley Research Center outlines the research findings. Water for tomorrow: drainage water recycling. Drainage Contractor (2017) — Describes Minnesota and North Carolina’s efforts in drainage water recycling. 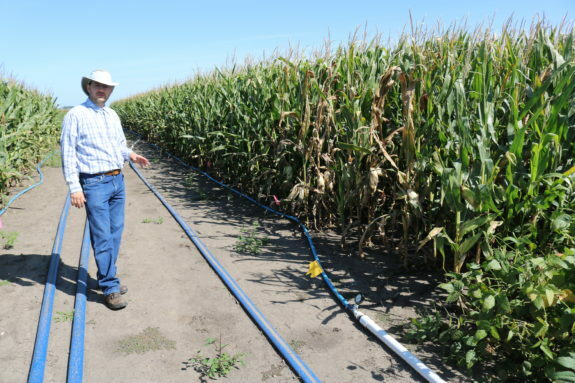 MU Research: Drip irrigation nets higher yields. University of Missouri Extension (2017) — Rusty Lee describes drip tape among other devices and practices used to boost corn yields. MU drainage system increases yields, reduces nutrient runoff. The Caldwell County News (Dec. 26, 2016) — Agronomist Kelly Nelson at the Greenley Research Center outlines the research findings. MU drainage system increases yields, reduces nutrient runoff. University of Missouri Extension (Dec. 21, 2016) — Kelly Nelson from the University of Missouri Extension outlines the research findings. 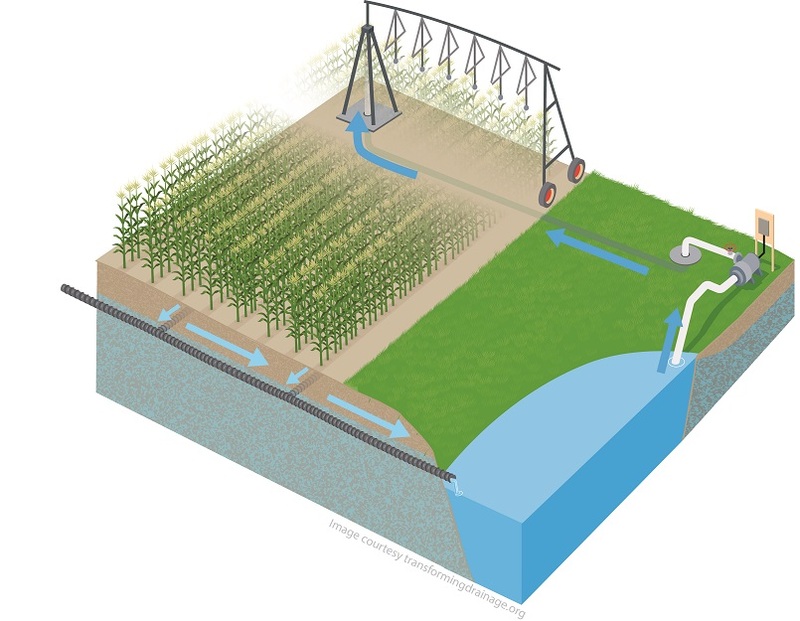 Advances in Irrigation. Brownfield Agriculture News (Jul. 25, 2016) — Video with Kelly Nelson on irrigation in areas where water is limited. Irrigation Research at Greenley. KRES-FM Radio (Jul. 20, 2016) — Audio clips from Kelly Nelson on irrigation. 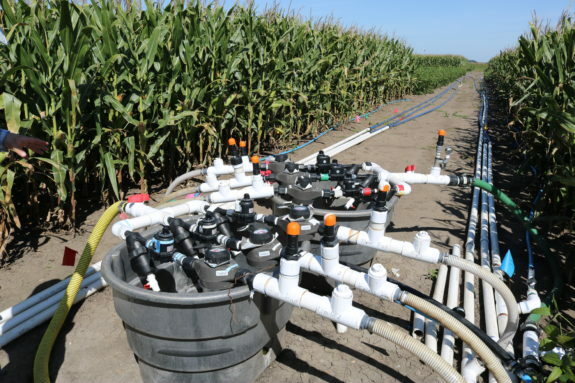 Innovative sub-irrigation: finding solutions in a closed-loop nutrient system. 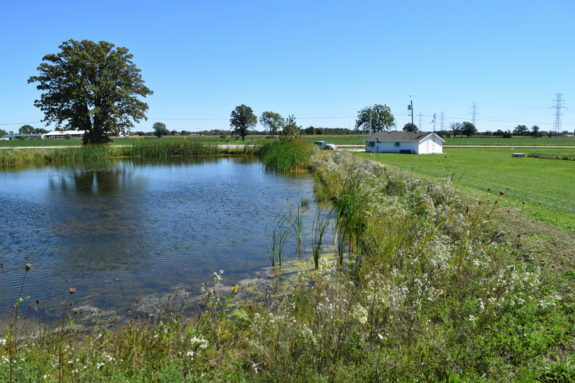 Drainage Contractor (May 2016) – Bakerlads Farm in Michigan use reservoir storage and constructed wetlands to manage wastewater from dairy operation that supply water for subirrigating cropland. Drainage Water Management. KBIA Mid-Missouri Public Radio (Jan. 28, 2016) — Short audio interview with Kelly Nelson and Dana Harder. MU drainage system increases yields, reduces nutrient runoff. Buffalo Reflex (2016) — Agronomist Kelly Nelson at the Greenley Research Center outlines the research findings. MU drainage system increases yields, reduces nutrient runoff. Daily Journal Online, Democrat News (2016) — Agronomist Kelly Nelson at the Greenley Research Center outlines the research findings. New farm pond recycles drainage water. Corn and Soybean Digest (Dec. 2015) – Describes how and why an Iowa farmer installed an 18-acre pond to provide water for center pivot system. New farm pond recycles drainage water. 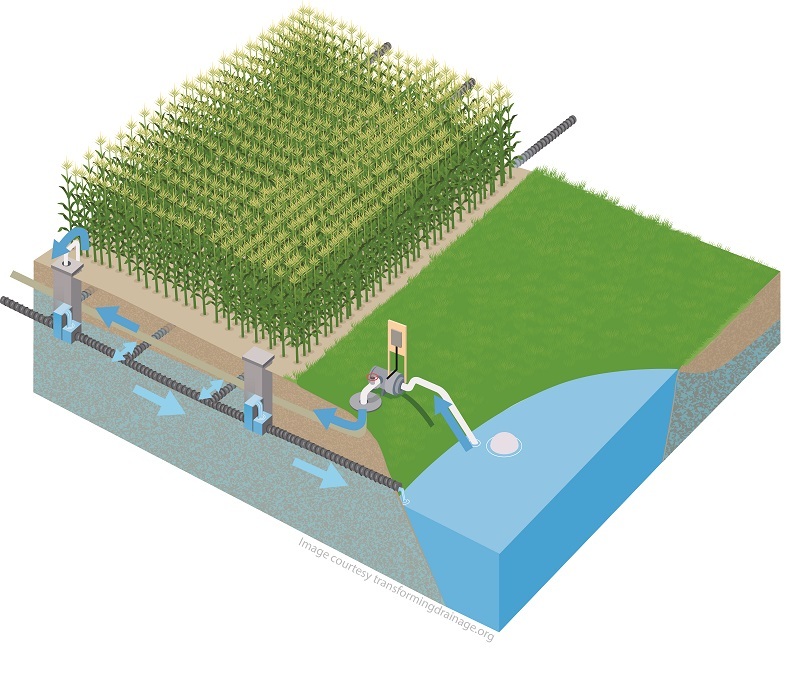 Corn+Soybean Digest (Nov. 19, 2015) — Article about drainage water recycling citing Jane Frankenberger. After decades of draining, some MN farmers look to put water back. MPR News (Apr. 29, 2015) — Story audio in addition to a Red River Valley farmer, Gerry Zimmerman, use of drainage water recycling. Nelson, K.A., and M.P.M. Mayola. 2017. Corn response to drainage water recycling in a blackoar silt loam. ASA-CSSA-SSSA International Meeting. Tampa, FL. Oct. 25, 2017. Lee, C, L. Bowling, and K. Cherkauer. 2018. Potential influence of drainage water recycling in Indiana. Center for the Environment, Environmental Community Mixer. Oct. 12, 2018. Purdue University. Moursi, H., M. Youssef, C. Poole, and G. Chescheir. 2018. An Overview of Drainage Water Recycling Research in North Carolina. NCERA 217 Annual Meeting, Raleigh, NC. Apr. 12, 2018. Niaghi, A. R., Jia, X., Scherer, T. F., and Steele, D. D.2018.Effect of control drainage and subirrigation on corn evapotranspiration. NCERA 217 Annual Meeting, Raleigh, NC. Apr. 12, 2018. Reinhart, B. and J. Frankenberger. 2017. Advancing drainage water storage to improve the resiliency and environmental performance of drained agricultural lands. Soil and Water Conservation Society 72nd International annual Conference. Madison, WI. Jul. 30-Aug. 2, 2017. Wesslak, R., K. Nelson, P. Motavalli, and C. Dudenhoeffer. 2016.Subsurface drain tile spacing affects yield variability of corn in a claypan soil. ASA-CSSA-SSSA International Meeting. Phoenix, AZ. Nov. 6-9, 2016. Hay, C.H. and Helmers, M.J., Evaluating Drainage Water Recycling Benefits for Crop Production in Iowa. In World Environmental and Water Resources Congress 2017 (pp. 507-517). Jia, X., Scherer, T.F., Steele, D.D. and DeSutter, T.M., 2017. Subirrigation system performance and evaluation in the Red River Valley of the North. Applied Engineering in Agriculture, 33(6), pp.811-818. Nelson, K.A. and Dudenhoeffer, C.J., 2016. Soybean Grain Yield Variability Associated with Drainage and Subirrigation Systems in a Claypan Soil. In 2016 10th International Drainage Symposium Conference, 6-9 September 2016, Minneapolis, Minnesota (pp. 1-7). American Society of Agricultural and Biological Engineers. Wesslak, R.N., Nelson, K.A. and Dudenhoeffer, C.J., 2016. Spatial Response of Corn Yields to Drainage and Subirrigation Tile Spacings in a Claypan Soil. In 2016 10th International Drainage Symposium Conference, 6-9 September 2016, Minneapolis, Minnesota (pp. 1-7). American Society of Agricultural and Biological Engineers. Evaluating Drainage Water Recycling Decisions (EDWRD)- This tool provides an estimate of the potential benefits that result from capturing drained agricultural water in various sizes of water storage reservoirs (e.g. pond, reservoir, storage tank, etc.) for reuse as irrigation, a practiced referred to as drainage water recycling.